The embryo is surrounded by a protective outer layer, named the zona pellucida or egg shell. The shell is involved in regulating the interaction between ovulated eggs and free-swimming sperm during and following fertilisation, along with protecting the egg/embryos from micro-organisms and immune cells during development. 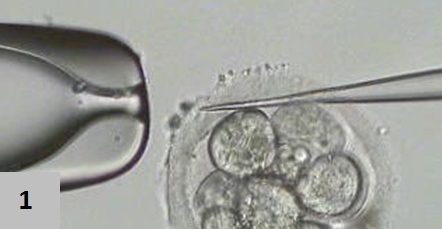 Once an embryo has reached the blastocyst stage, it breaks out (also known as ‘hatching’) of this protective shell in preparation for implantation into the uterus. The artificial thinning or opening of the zona pellucida is known as Assisted Hatching (AH), and this technique has been utilised since the late 1980s. 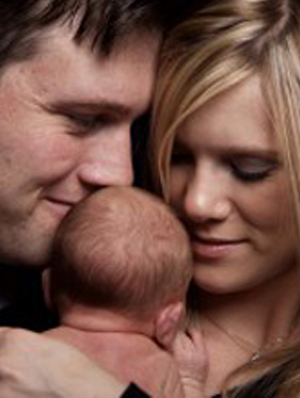 It is used in an attempt to improve the chances of implantation and clinical pregnancy during assisted reproduction. 1. 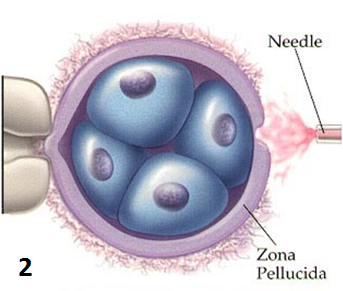 Mechanical Assisted Hatching – this method creates a slit in the zona by inserting a very fine needle. 2. Acid Tyrode Assisted Hatching – this involves applying a diluted acid solution to the outside of the zona to form a thinned area or hole. 3. Laser Hatching – a computer-controlled laser beam is positioned and fired at the outside edge of the zona, with the ability to either thin or completely breach the protective shell. This method of assisted hatching can be performed the fastest, ensuring the embryos are returned back to optimal incubation conditions as soon as possible. 4. Peizo-micromanipulation – this involves applying a vigorous vibration to a fine needle, which causes it to produce a ‘flicking’ motion near the shell. This motion is used to mechanically erode the zona to either thin or completely breach the egg shell. 5. Pronase enzyme – with this method, the embryo(s) are briefly immersed in a diluted enzyme solution, which thins and softens the zona. At Fertility Solutions, laser assisted hatching has been elected as the preferred method for performing assisted hatching of embryos based on its precision, simplicity and compatibility with our present instrumentation. AH can be performed to both fresh IVF/ICSI and frozen embryos on day 2 or 3 of the embryos development; prior to transfer on days 2, 3 or 5. It will not be performed to embryos which are about to be frozen, as the hole in the zona alters the dynamics of cyroprotectant penetration into the embryos. It can however, be used on frozen embryos after being thawed. Embryo Damage – Although the incidence of this is expected to be small, there is a possibility that the procedure could inadvertently damage the entire embryo, or cause damage that would reduce the viability of the embryo. The additional handling involved, which removes the embryo(s) from optimal culture conditions during the assisted hatching procedure should also be weighed up against the potential benefits. Multiple Pregnancies – Many studies have shown that there is an increased risk of identical twins from the transfer of artificially hatched embryos. Although it is not clear as to the exact reason for this increase, it is thought that it may be due to the artificial breach of the shell in a region different from that which should occur naturally and a portion of the inner cell mass (which forms the foetus) becomes trapped, possibly forcing the embryo to split into two embryos. 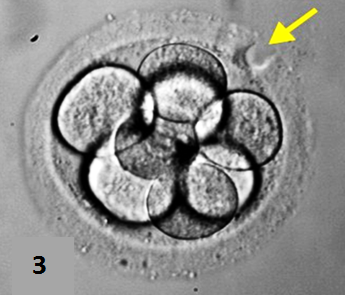 Multiple pregnancy itself can result in many serious complications as described in one of our other articles, Transferring Two Embryos During IVF Cycle? If required, this technique will involve an additional fee to your regular cycle costs. Unfortunately, at this stage, this fee is NOT claimable from Medicare. However, depending on your level of cover, your private health insurance may provide some reimbursement. For more information, please arrange a consultation with one of our friendly administration staff by calling 1300 FERTILITY (1300 337 845).